It has been years since I read the book so this movie was brand new to me. Visually the movie was pretty interesting. 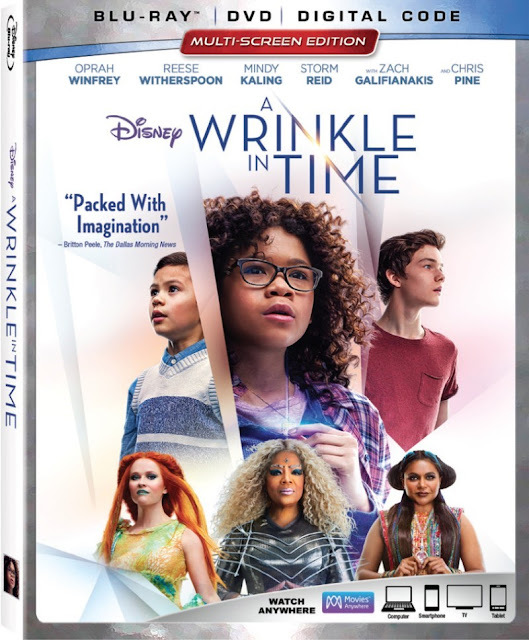 Our main character Meg is played by an adorably cute Storm Reid who is perfect in her insecure, nerdy teen who is still upset of the loss of her father (played by Chris Pine) when he mysteriously disappeared. She lives with her mother and her genius brother Charles Wallace who my daughter thought was utterly adorable. All seems somewhat normal in Meg's life. She's a teen trying to not give up on her dad while being tormented by the mean girls at school until Mrs. Whatsit played by Reese Witherspoon shows up at her home and mentions her father and the movie takes off. Our main character, her brother and a friend Calvin (Adorable Levi Miller) end up on a search to find dad through realms, and planets full of wonder, color, CGI effects, a very large Oprah and of course good versus evil which is always the basis of all good movies. I enjoyed it enough. There were moments when I thought it was a bit of a stretch but loved the relationship between brother and sister and who doesn't want a little girl to find her loving father? Chris Pine is BTW the perfect daddy; loving, attentive and full of wisdom. My favorite character is Reese Witherspoon as Mrs. Whatsit.